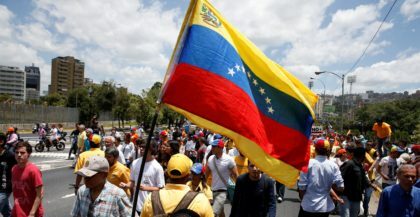 Venezuela will reconsider in all likelihood its recognition of the Polisario separatist group under the administration of interim President Juan Guaido. Actually, Juan Guaido expressed his will to relaunch, on sound and serene bases, the relations of cooperation between Morocco and Venezuela, and to remove the obstacles, which could hamper their evolution. Juan Guaido expressed this willingness at the first phone talk he had Tuesday with Moroccan Foreign Minister Nasser Bourita. The phone talk took place at the initiative of the interim President. Bourita told his interlocutor that Morocco was following with the greatest attention the developments in Venezuela, the Foreign Ministry said in a statement. The Foreign Minister also expressed to Juan Guaido Morocco’s support for all the actions taken to meet the legitimate aspirations of the Venezuelan people to democracy and change. If analysts understand behind the lines that Guaido’s statement about removing the obstacles hampering bilateral relations means withdrawing recognition of the separatist front, Foreign Affairs Advisor at the Venezuelan parliament Manuel Avendano said this in a clear-cut way. “Venezuela will reconsider its recognition of the Sahrawi Republic under the government of Guaido,” Avendano told MAP correspondent in Caracas. The recognition of the Algeria-backed SADR Republic is more of a fallout of ideology espoused by Nicolas Maduro’s regime than a step to find a peaceful solution to the conflict, he said. “We want a peaceful solution to this regional dispute (…) We support any process that would lead to this end, within the framework of the UN”, said Avendano, reiterating Guaido government’s wish to establish “open”, “extended” and “solid” relations with the Kingdom. The Polisario front, which by the past used ideological rhetoric to delude South American leaders, is now on the demise in Latin America where only failing states such as Venezuela and authoritarian Cuba are still attached to defending separatism. The Polisario has been dealt severe blows in South America recently. Last year, Paraguay expressed support for Morocco’s autonomy initiative as a lasting political solution to the regional dispute over the southern provinces. Paraguay’s support comes in a series of similar stands expressed by other Latin American states, including Uruguay and Peru. An increasing number of states are coming to terms with viewing the Polisario as totalitarian organization fed by an ideological anachronism peculiar to the Cold War era. Over the last years, support for the Algerian-sponsored separatist thesis in the Moroccan Sahara has been waning as 43 countries have withdrawn their recognition of the SADR entity out of 80 that previously recognized it in a Cold War context. Furthermore, as a relic of the cold war, the Polisario remains obedient and dependent financially and diplomatically on its paymaster, Algeria, which uses it to achieve regional hegemony to the detriment of regional stability.